22 inch full octagon barrel. 2/3 mag. Cal 32-20. Very nice bore. Of the period replacement sights. Pistol checkered Fancy Burl Walnut stock is in VG condition with most original varnish. Some wear to the forearm. Barrel retains about 90% thinning blue. Receiver has about 50-60% case colors ranging from vivid on the back to a nickely color towards the front. 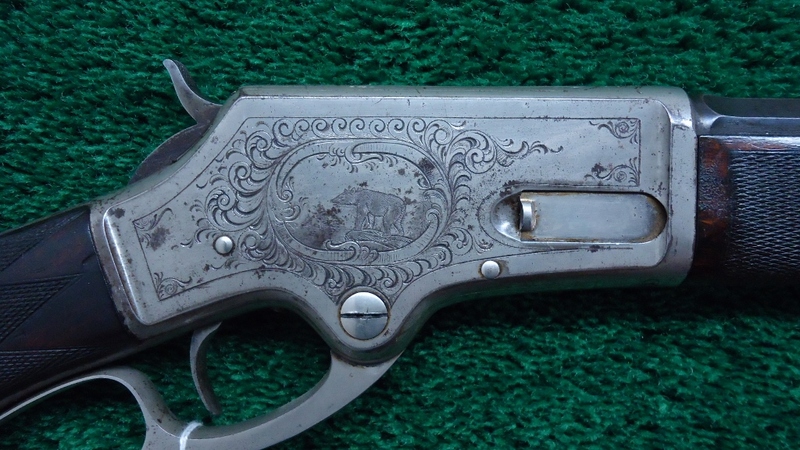 Engraved in factory pattern number 1 featuring a buck deer in an oval on the left hand side. Crisp sharp action. Cute little factory engraved Marlin.